Magical, epic, urgent, and poetic, the road weeps, the well runs dry explores issues of spirituality and identity, education and migration, through the story of Wewoka, Oklahoma, the first all-black town in America. Black Seminoles, people of both African- and Native-American heritage, watch all they have built collapse in a clash between the new religion and the old way when the well water runs dry. 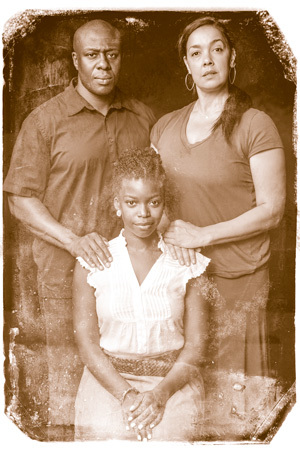 This exciting play by Marcus Gardley will be seen all over the United States in 2013. Directed by Marion McClinton; dramaturgy by Nakissa Etemad. Note: This play contains mature themes and adult content. Recommended for ages 15 and up. Run time is about 2 hours, 30 minutes with intermission. All tickets are Pay-What-You-Want. Pick your own price for every performance, every night. But tickets online or call 612-825-0459. 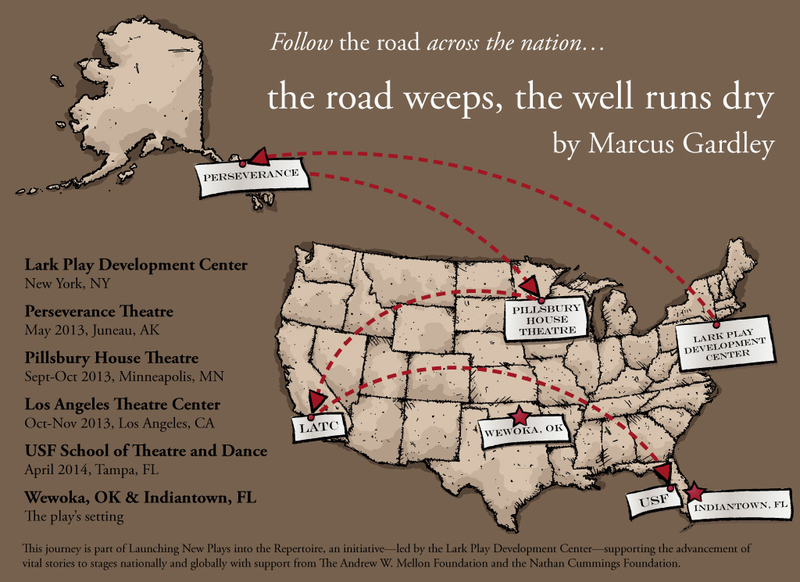 All remaining performances of The Road Weeps, The Well Runs Dry by Marcus Gardley are SOLD OUT. Our box office will begin a wait list one hour before all our sold out shows. You must be present to get on the wait list. Please note that we generally sell only 5 to 10 tickets off the wait list; and no matter where you are on the wait list, we cannot guarantee admission. Pre-show discussion with partner Artistic Directors: Sunday, Oct. 13th at 2:00 p.m.
Continue your conversations after the performance at Blackbird Cafe on 38th and Nicollet. Show them a program after the performance you attend and receive 20% off an after-show dessert! Pillsbury House Theatre is joining together with 4 theatres around the country to launch the road weeps, the well runs dry into the American Theater repertoire. See the play people will be talking about from coast to coast at Pillsbury House Theatre September 27 to October 27, 2013. Led by the Lark Play Development Center, Launching New Plays into the Repertoire is a national initiative to transform the American theater repertoire to reflect shifting demographics and emerging issues of local, national and global concern. This is accomplished by “creating a movement” around a single playwright’s vision by a consortium of five theaters that commit to developing and producing what many consider “risky” plays and to engage in local and national conversations about each play’s relevance and potential impact. The first three pilot rounds of this program, involving 12 individual theaters and three playwrights, will be completed by June 2014. Playwright Marcus Gardley and his play, the road weeps, the well runs dry is the centerpiece of Cycle II. The consortium of theaters producing this play consists of the Los Angeles Theatre Center, Perseverance Theatre, Pillsbury House Theatre and the University of South Florida. In advance of each production, conversations around the play’s themes of migration, identity and education. This initiative is made possible with leadership support from The Andrew W. Mellon Foundation with additional funding from The Nathan Cummings Foundation.